25 % off sale , on most items , in ebay store Football Fashions , sale is on now until 19 August , 2011. 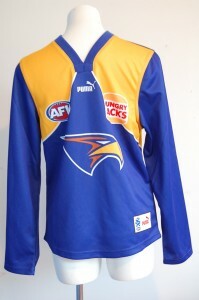 Buy new , and superior quality recycled , AFL Licensed , Sponsored Merchandise . Sale items include , Football Jumpers , and assorted supporter wear , scarves , beanies , caps , ponchos , training singlets , tops and jerseys . Discounted jumpers , jerseys , guernseys , include AFL Teams Brisbane Lions , Port Adelaide Power , West Coast Eagles , St Kilda Saints , Sydney Swans andMelbourne Demons . Grab and bargain , wear your teams support these Finals . This entry was posted on Monday, August 15th, 2011 at 10:14 am	and is filed under AFL, football jumpers, NRL. You can follow any responses to this entry through the RSS 2.0 feed. Both comments and pings are currently closed.